L. f. graellsii XB September 16 2007, Landfill VRSU de Colmenar Viejo, Madrid, Spain. Picture: Delfín González. 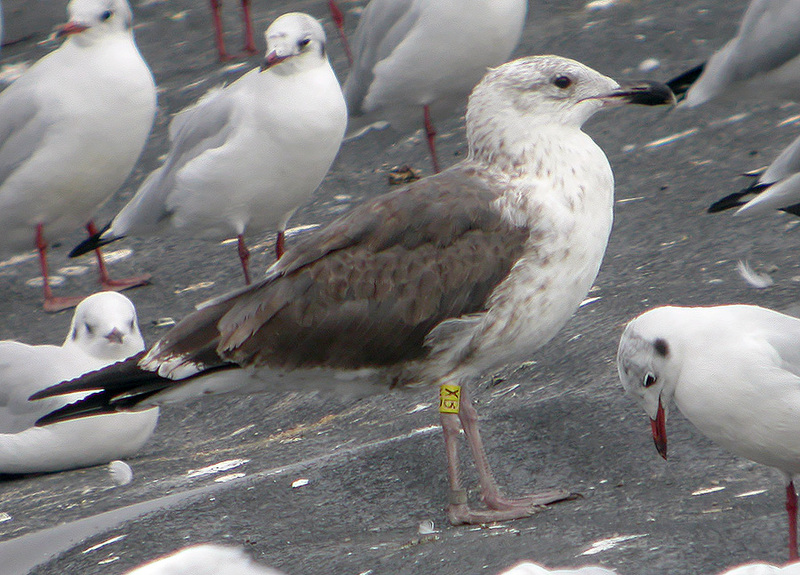 Ringed 2cy graellsii in early 2nd winter, ringed in the Netherlands by Roland-Jan Buijs, summer 2006 as pullus at Moerdijk (Shell Chemie-West), Noord-Brabant, NL 5141.00 N 433.00 E.
Scapular region is a mix of old brown and grey feathers. Several wing-coverts (inner gc) and upper tertials more adult-like grey, replaced in partial autumn moult. This autumn moult is not finished yet, as the central mc are still growing. Other coverts with 'shaft-streak' pattern, lacking transversal bars.